Sometimes, you just have to go back to the basics. It's easy to forget where your investment knowledge started when you're being bombarded day by day with new, catchy investment strategies. After trying every trick under the sun, it's nice to take a step back and make everything simple again. Even the most basic investments can be incredibly lucrative for the investor who's willing to take the time and make an effort to pick their stocks carefully. There is a big difference between something being simple and something being easy. In investing, the simple part is the approach. This is basically setting up a list of criteria — things you want to see from the company — and buying companies that meet those criteria, and will for a long time. The “not easy” part is being able to value the business, then pulling the trigger and actually buying the stock. And many times, the greatest opportunities occur in the midst of fear and panic. For instance, just eight years ago Lehman Brothers declared bankruptcy and the stock market went into a tailspin. You could’ve run your finger down the P/E column of the newspaper and found dozens of financially sound companies trading for single-digit P/Es. During the months preceding the market low in March 2009, there was plenty of low-hanging fruit to pick — fundamentally strong companies that were trading at bargain-bin prices. If you'd been researching companies at the time, you would have likely gone over your own numbers more than once. And well you should! A big part of fundamental analysis is making sure your numbers are accurate; it's too easy for a company to be over- or under-valued on the market due to some media madness or a popular opinion. What separates the great investors from the pack is their ability to stay rational in the face of market turmoil and media drama. They have a keen ability to think clearly and stay unemotional, rather than jumping on the next big bailout investment. It's hard to distance yourself from the hype of the market, but it can be done. You may or may not know the names Ben Graham and David Dodd, but the two shaped a generation of investors with this strategy. In fact, they achieved one of the most difficult things in mentoring investors: creating an approach that not only succeeded, but lasted through decades of investing, and is still referred to today! That approach was value investing, and it's spelled out in the duo's famous book, Security Analysis. 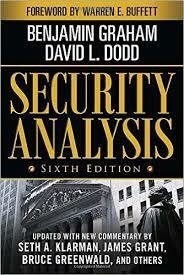 The book's title pretty well explains Graham and Dodd's main idea: that a secure investment could only be found through thorough and accurate analysis. The definition of value investing found in Security Analysis encourages investors to focus on the “intrinsic value” of a company's stock, and to ignore the market mania. At its core, value investing really just aims to find what a company is really worth. And fundamental stock analysis is how you can find this out. As Buffett notes later, this idea is simple, but not easy. Graham and Dodd's value investing isn't far off from fundamental investing. Both look at many of the same numbers, and both want to pick only sound companies trading at a discount. More than anything, both approaches want to find the stocks with the best upside potential possible. Investors using these fundamentals know the ups and downs of a company's balance sheet and income statements. They look at the historical numbers as well as the most recent results to get a full picture of a company's momentum and value. And it's not even as complicated as it may sound. In fact, I've got one example that's so clear-cut, it's practically transparent. You'll have to bear with me though; this example isn't actually a millionaire investor... he's a baseball star. Boston Red Sox outfielder Ted Williams was the last baseball player to have a batting average of .400. In 1941, Williams batted .406, and since then, only four players have hit as high as .390. Many baseball historians say that Williams’s record will never be broken. You can learn a lot about investing from Williams's winning strategy. You see, Williams had an analytical mind and was a disciplined hitter. 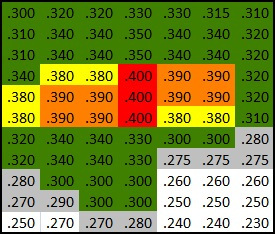 He estimated his batting average in each area of the strike zone, and would swing only when the ball was in the area where he had the highest probability of getting a hit. He calculated that if the ball were thrown right down the middle — red zone — he would have a .400 batting average. If he swung at pitches in the lower-right or left-hand corner of the strike zone, he figured his average would plunge. Williams’ approach to hitting is very similar to one common view of fundamental investing: it also involves discipline coupled with straight analysis. He considered his own historical performance, what he knew of his own assets and liabilities, and made sure he only took his chances when he knew there was a strong probability of success. But rather than a strike zone and calculated swings, smart investors use a bull’s-eye and invest in only those stocks that are fundamentally strong and trading at good prices. When looking at these different valuation strategies, it's important to keep in mind that you're investing in the company, not just the stock. You'll want a strong company that will last in the long-term. And you find those by looking right at the company's fundamentals. How strong are they now, and how long will that last? It's simple, logical thinking. You have to keep this in mind simply because it's too easy for a stock to rise or fall in price or value due to public zeitgeist, or public opinions that don't reflect the true value of the company. You'll also want to decide on your own margin of safety. That is, you'll have to be sure you're getting the stock at enough of a discount that there's room for error if something doesn't go according to plan. Risk is a basic tenant of investing; too much, and you could lose big, but too little and you could miss out on amazing opportunities. And at the end of the day, once you've found financially sound companies, it comes down to the price you pay. One of the most common mantras in the investing world is just to buy low and sell high. Right now, with market sectors slipping left and right, is the time to start picking these stocks up at great prices. As long as you continue to buy financially sound companies that are trading at fair, or even bargain prices, you can be confident that you'll keep hitting that bull's eye. All it requires now is discipline and patience.